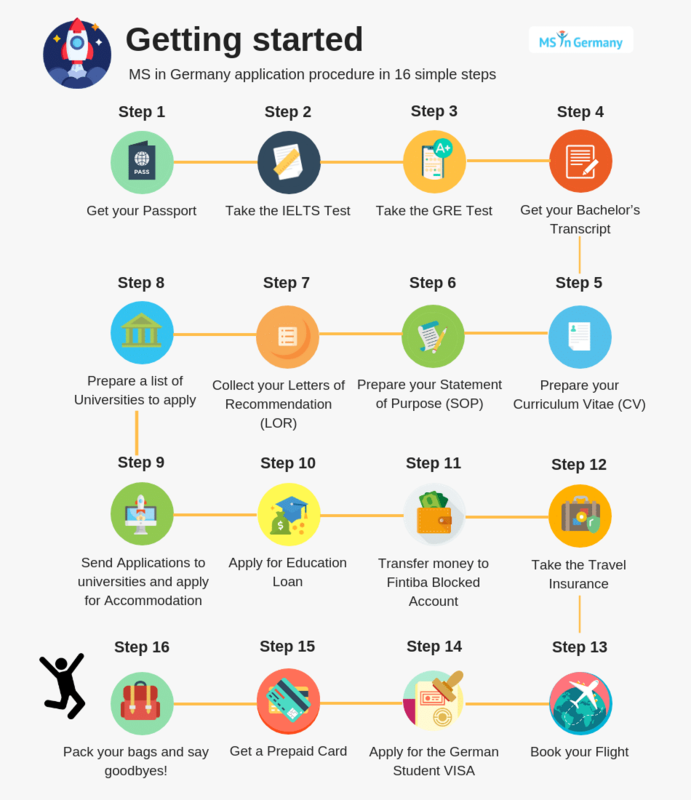 The complete application process for higher studies in Germany is explained below in 16 simple steps. Assuming that you are just starting off, your first task is to get your Passport. This step is not optional. Your passport is like a passkey which unlocks many doors along the way. Refer this section to know the entire process of issue of a Passport in India. You may need to prove your English language proficiency in order to apply for English-taught masters programs. You can do that by taking an English language test (IELTS/TOEFL). IELTS is a popular option and is widely accepted by German universities. This section will take you through everything you need to know about the IELTS test. Some German universities also list GRE score card as an admission requirement (TUM, RWTH Aachen). If that is the case, you need to take the GRE test. This test will measure your English and basic math skills. This test usually takes far more preparation time than IELTS. Your transcripts and degree certificate are the mandatory requirements for any course (exclude degree certificate if you’re still in college). If you are a working professional, your next step is to visit your university and order few copies of your transcripts. It might take few days/weeks before you get them. Read this section further to know specific details. Your CV is another mandatory document listed on every university course requirements page. It is necessary that you create or update your CV based on university type. This section will guide you through the process of creating/updating your CV. Statement of Purpose is perhaps one of the most important documents you send along with your application. This is the one document that you have to create from scratch. It takes more time and effort than you may think to end up with a satisfactory version of your SOP. Check this section for more information and get started soon. Letter of Recommendation is the (positive) personal assessment given by your supervisor. LORs are given a relatively higher level of consideration in European universities and play an important role in getting you the admission, especially into the Technical Universities. You need to collect 2-3 LORs from your past or current supervisors (university professors, project manager etc.). Have a look at this section for further details. Now, you have got all the required documents, it is time to start shortlisting some universities based on your profile and preferences. This is the mandatory step because unfortunately, 47% of students who apply for Germany end up with no university admission.You can use our experts help in University Shortlisting, for profile evaluation process and to receive a consolidated shortlist which includes deadlines, application method, contact details, application portal link etc. Now that you have got all the required documents, it is time to start the application process. Most universities ask you to apply online and then send out the hard copies of the documents. For some universities, you may have to apply via uni-assist. Also, Many german universities will allow you to apply for the student dorms without your enrollment. This fact is not known to many. Take advantage of this and apply early. Visit your target university’s Studentenwerk website and apply online. Read further into this section to know more. You may be required to apply for the education (student) loan to support yourself during your stay in Germany i.e. for your tuition fee, travel and living expenses. Applying for a student loan could be a tedious process. This section delineates the whole process and gives you few important tips. You will be asked to transfer the money equivalent to 8700 euros to a German bank blocked account prior to your Visa Interview. This is again a mandatory step. Although the process is simple, there are few things which need your attention like required documents, how long it will take to open. Find out more in this section. This is a trivial yet mandatory step in this process. Your travel insurance covers you during your travel and initial few days in Germany. You will be asked to produce this document during your Visa Interview (Bangalore) or during Visa collection (Chennai). Check this section for a short procedure for getting your travel insurance. This is the last step before your Visa Interview. If you are not familiar with flight booking, check out this section for few tips and the step by step procedure. This is the final step to achieving your goal. Also, since you have come so far through the exhausting application process, this step could get on your nerves. This section will give you some clarity and hopefully make you feel better and prepared. Once you arrive in Germany, it may take few days before you can withdraw money from your German bank account. A Prepaid card will come in handy in such a situation. You can pre-load the money into this card and use it just like any other debit card. Learn more about prepaid cards in this section. Now it’s time to sit back and let your mom take care of the packing! Just kidding, you can’t be negligent about this step. Get the shopping list right and be smart about things to pack. Read this section further to know all the things that you need to take care during last few days in India.